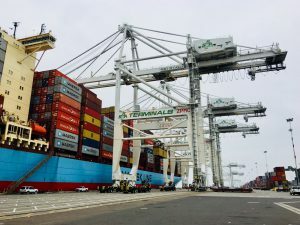 Oakland, Calif. , 2018-Aug-27 — /Travel PR News/ — Four ship-to-shore cranes at Oakland International Container Terminal (OICT), the busiest terminal at the Port of Oakland, are 27 feet taller following completion this week of a year-long, crane-raising project. The fourth and final raised crane went back into service yesterday and is ready to serve larger ships with containers stacked high above vessel decks. Oakland already works the biggest containerships that call North America. Stevedoring Services of America (SSA) operates OICT and managed the crane-raising project in partnership with the Port of Oakland. Raising four gantry cranes increased their lifting height from 115 feet to 142 feet above the dock. The work began May 8, 2017 and was completed this week. The giant cranes can soar up to 393 feet, the height of a 39-story building, with the booms in the highest position. “Raising cranes is part of our infrastructure investment strategy to increase the Port of Oakland’s competitive edge on the US West Coast,” said Port of Oakland Maritime Director John Driscoll. “We’re confident that this will help us move more imports and exports through Oakland.” The crane-raising project cost approximately $14 million. The taller crane is tested and placed back in operation. Total container volume in Oakland was up 2.3 percent for the first half of 2018. The Port, in partnership with its terminal operators, anticipates heightening more cranes and adding new ones over the next few years. The Port of Oakland oversees the Oakland Seaport, Oakland International Airport, and nearly 20 miles of waterfront including Jack London Square. The Port’s 5-year strategic plan – Growth with Care – pairs business expansion with community benefits, envisioning more jobs and economic stimulus as the Port grows. Together with its business partners, the Port supports more than 73,000 jobs in the region and nearly 827,000 jobs across the United States. Connect with the Port of Oakland and Oakland International Airport through Facebook, or with the Port on Twitter, YouTube, and at www.portofoakland.com. This entry was posted in Airports, Transportation, Travel, Travel Services, Travelers and tagged Container Terminal, crane-raising project, Ed DeNike, John Driscoll, Oakland, Port of Oakland. Bookmark the permalink.